Last week I wrote a post about my time constraints when trying to be admin of HockeyJerseyConcepts. After reading that post again recently it left a sour taste in my mouth. How come I'm not doing more to make this work? Surely there's something I can do? Well there is something I can do! I'm making some changes to HJC. As a reader you won't have to do anything different except be aware of these changes. Otherwise, keep sending in your concepts and keep leaving comments on each post. A HJC week will now run Friday to Thursday. Previously we ran Sunday to Saturday, which makes more sense, but try and work with me here. My posts informing everyone of the winners and all the new contests and anything else will still take place on Saturdays. As such, Sundays will continue to have a regular concept post (currently written by Caz). On Thursday (our new last day of the week), concepts can be nominated for COTW up until Friday at Noon Eastern. This allows a fair amount of time on all posts for concepts to be nominated. Any nominations left after the deadline will be disregarded. 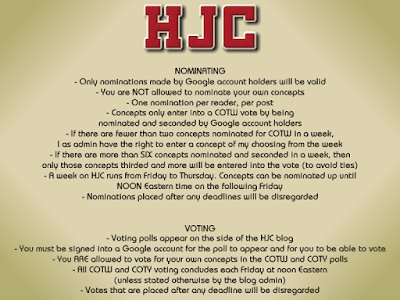 COTW and COTY voting will also end every Friday at Noon Eastern. I won't be able to close the polls at this time every week, but every vote comes with a time stamp. Votes left after the deadline will be disregarded. COTW and COTY nominees and polls will be going up sometime every Friday evening. This will be the most inconsistent thing on HJC now. However looking at voting patterns from nearly the past year it will have ZERO effect on people getting their votes in before the deadline. Competition entries and voting deadlines will also be Fridays at Noon Eastern. Now when I sit down to do my admin work every Friday I will have all the winners, nominees, entries, and anything else waiting for me. It will allow me to get things done quicker. For you the reader, it won't change much as you'll still get all of the info on the Saturday post as usual. Hopefully with these changes I have addressed my concerns as well as yours. Soooo... what happens with the Sunday concepts? 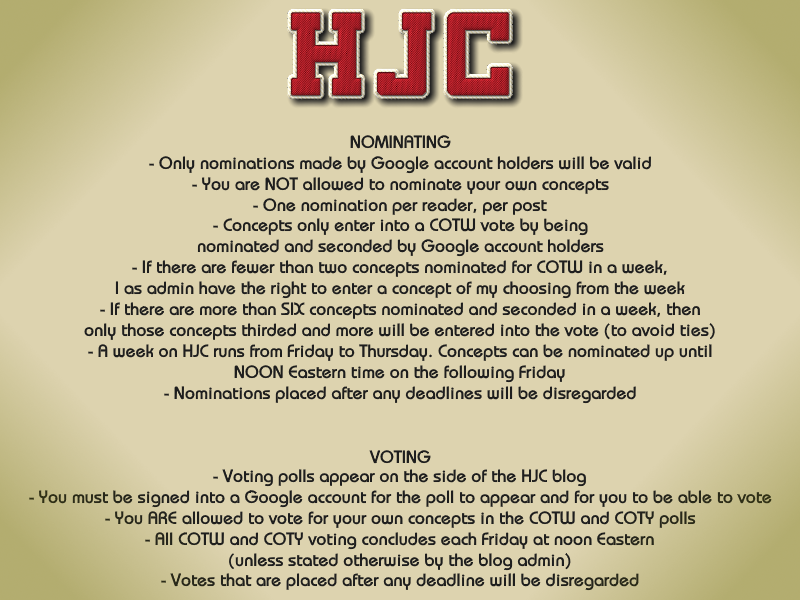 Sunday is the 3rd day of the HJC week.